Gamay is a red-wine grape originating in the Loire Valley of France; it is the grape of Beaujolais wine. There has been, especially in the U.S., some confusion about the type, owing to the early use of the name for some grape types that turned out to be rather different animals. As science began to settle out the differences by genetic analysis, the true Gamay was distinguished from a couple of other types, which were then called "Napa Gamay" and "Gamay Beaujolais"; the so-called "Napa Gamay" was renamed in 2007 to Valdeguié, while "Gamay Beaujolais" was determined to just be an inferior clone of Pinot Noir. Neither of those make notable wines. 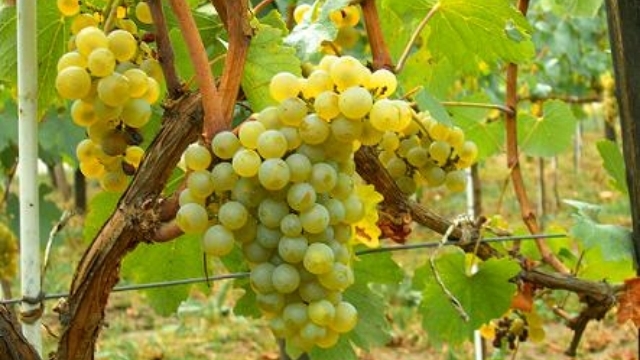 The true Gamay grape is now more formally known as "Gamay Noir à Jus Blanc", which is a nod to its white ("blanc") interior and juice ("jus"). As noted, the chief and most noted use of Gamay is in Beaujolais, of which it is the sole constituent. It is also somewhat used in other parts of France in blends, making wines that are similar to Beaujolais but with some other flavors from the other wines used. Small amounts of Gamay are also grown throughout the winemaking world. But you are far and away most likely to encounter it—especially as a monovarietal—in Beaujolias. There is an especial fad for what is called "Beaujolais nouveau", which is very young Beaujolais. Nouveau is made in the southern part of the Beaujolais appellation, where the soils are distinctly alkaline, and to produce a drinkable wine from those vines, it is mandatory to use a vinification process called "carbonic maceration", in which the whole grapes are fermented in a carbon-dioxide-rich environment prior to crushing, which effectively ferments the juice while it is still in the grape. The net result is a fairly fruity wine with low tannin that is ready to drink, but has close to zero bottle life (hence the rush to get it). The fad for it is really making a virtue of necessity, and in recent years has attained the status of craze. On "Beaujolais Nouveau Day" (always the third Thursday of November), bottles shipped arond the wine-drinking world are released for sale as of 12:01 a.m., and crazed buyers stampede to get them everywhere, from France to China. The wine is not worth the fuss (as quoted in Wikipedia, "The wine critic Karen MacNeil has compared drinking Beaujolais nouveau with eating cookie dough"). The essence of well-made Beaujolais is lightness and delicacy: it is not accidental that a clone of Pinot Noir was mistaken for Gamay. The wines are fruit-forward (though ideally not "fruit bombs") and are intended for light, casual consumption. When so made and so drunk, they are very pleasant indeed. There are also somewhat bigger and heavier versions of Beaujolais; though they have their fans, most feel that vinifying Gamay in that way is trying to make of it something that it inherently is not. The usual descriptions of Beaujolais are much alike, and Wikipedia's will do: vibrant youthful fruit expressions reminiscent of bright crushed strawberries and raspberries, as well as deep floral notes of lilac and violets. The wine is meant to be, and should be, drunk quite young. It is pointless, and likely counter-productive, to cellar it. Factoid: Gamay has always been in competition with the vastly superior Pinot Noir for growing space. In the middle ages, it was twice (1395 and 1455) actually outlawed by ducal decree. "Gamay-based wines are typically light bodied and fruity. Wines meant to be drunk after some modest aging tend to have more body and are produced by whole-berry maceration. The latter are produced mostly in the designated 'Cru Beaujolais' areas where the wines typically have the flavor of sour cherries, black pepper, and dried berry, as well as fresh-cut stone and chalk." "While the variety offers fresh red fruit and candied aromas, it typically delivers little in the way of flavor concentration and body weight. Characteristic fruit aromas of Gamay wines are red cherries and strawberries, often with boiled candy and banana notes. Some darker wines from the granite soils of the Beaujolais Crus can show more dark-raspberry and black-pepper qualities. Gamay usually has a good acid structure with very low tannins, making it better suited for early consumption." "The wines produced are naturally relatively high in acidity and can be light in both colour and tannin, which makes simple Gamays good drinks in their youth, and flattered by being served relatively cool. . . Some Beaujolais on the other hand, notably Morgon and Moulin à Vent, are supposed to taste more and more like Pinot as they age, even though they are made exclusively from Gamay grapes. The proportion of Beaujolais that is made ‘seriously’ nowadays continues to rise once again. . But more and more growers, particularly those in the Beaujolais crus, are once again, like their grandfathers, making their wines much more in the way of traditional red burgundy, fermenting the grape in open wooden vats and ageing them in small barrels, so that the overall effect is a much deeper-coloured, more tannic, long-lived wine that may not be ready to drink until four or more years after the harvest. These wines still have Gamay’s trademark refreshing acidity but they also have many attributes that make them more like red burgundy. The result in a way is confusion. The Gamay grape no longer has a single image but on the international marketplace there are now examples all along the spectrum from thin and vapid to pretty and refreshing to deep-flavoured and rewarding." "Beaujolais Villages: Carbonic maceration and fresh fruit flavors are also characteristic of this more refined drink from the hilly central part of the Beaujolais district. The extra finesse comes from better vineyards, lower yields, and also from its not being pressed early and hurried through fermentation. If the wine is no more than a year or two old, you can usually count on a reliable, tasty drink at a bargain price. Cru Beaujolais: Vastly under appreciated, these wines come from the best vineyards in the north-central part of the region. They can show remarkable concentration and longevity while still boasting a bundle of Gamay flavor. . . [they] are, for the fruity-wine lover, a great bargain. These cru Beaujolais can take on Pinot-like characteristics, and pair well with foods like roast chicken or grilled salmon. Unfortunately, they usually don't carry the name Beaujolais on the label. To find them, you will have to remember their individual names: Brouilly, Côtes de Brouilly, Chenas, Chiroubles, Fleurie, Juliénas, Moulin-à-Vent, Morgon, Regnié, and St. Amour." "French variety planted predominately in Beaujolais where it is the grape behind everything from light and often acidic Beaujolais Nouveau through to the more serious and well-structured wines from the 10 cru villages. . . The majority of Gamay wines in Beaujolais are labelled as Beaujolais or Beaujolais-Villages and are deliciously juicy, easy drinking, gulpable wines. Of more interest are the Cru wines from the 10 villages in the north of the region where the soil is predominantly granitic schist and where the vines are planted on gently undulating slopes. These can be well-structured, intensely perfumed wines, redolent of ripe black fruits and, while delicious young, will reward medium-term cellaring. Gamay is also grown in the Touraine region of the Loire where it produces soft, well-balanced, gluggable wines for drinking young." 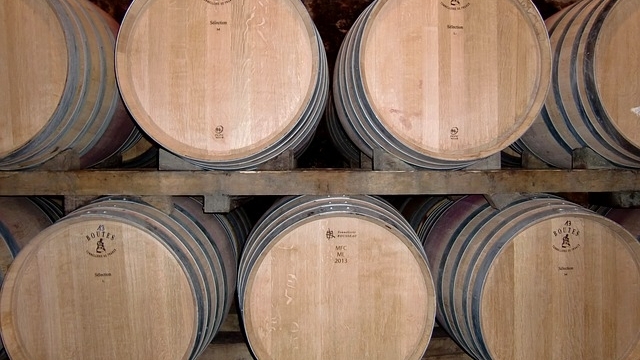 "Typically these wines are not aged in oak barrels and are released early. (Beaujolais Nouveau, which appears on shelves little more than a month after the grapes are harvested, is the extreme example.) Beaujolais from the region’s ten crus, however, can be wonderfully structured and some can even age. Little Gamay is grown outside of Beaujolais." "When shopping, look for 'Beaujolais-Villages' on the label for reliable quality, and in particular for a wine from one of the ten Beaujolais Crus (including such names as Fleurie). The key to Beaujolais is the way the Gamay grape is fermented, in a closed container without oxygen to emphasise the juicy cherry fruit. It often also gives a distinct aroma of raspberry bubble-gum." "The Gamay grape is inherently acidic and carbonic maceration (whole grape fermentation takes place in a high CO2 environment) is used to downplay the acid and lift the fruit. Typically the Gamay grape is used to craft low-tannin, fruity red wines. " "The wine produced from the Gamay grape tends to exhibit characteristics that are very similar to that of Pinot Noir. Gamay is a light-bodied, fruity red with tart flavors of cherries and raspberries and even banana. The banana flavor is the result of something called carbonic maceration . . . Gamay is a great red wine to accompany meat and cheese plates as well as salad dishes and even roast chicken and fish." As it happens there is a Beaujolais vintner that is quite well-respected, that makes Beaujolais Cru wines from nine of the ten Crus (plus a basic and a Villages), and is very reasonably priced. We have thus made our list entirely of that one vintner's products (they make more than we list, but these are all that seem to be available in the U.S.). You can thus, if you like, do a set of tastings in which the distinctions will be those of the Crus themselves, not of the winemaker's approach. That one selected vintner is Henry Fessy. You can read critic Quentin Sadler's take on the Henry Fessy winery and its wines, and do some further browsing on your own, or you can just look at the reviews quoted below for each wine. If you are looking for some other possibilities (we try to keep these lists to reasonable lengths), consider any Beaujolais, from basic to Crus, from Louis Jadot (a négociant). ♦ Upon pouring the first glass, I’m hit with scents of intense red fruit (particularly strawberry and raspberry), hints of wood, and dry grass. After several minutes of swirling the glass to open up and oxidize the wine the overall aroma hadn’t changed, leading me to believe that this was going to be a wholly consistent bottle, both in aroma and taste. My first sip was followed by a big whiff of the wine. I let it sit in my mouth for a few seconds and I immediately tasted the red fruit that is ever-present on the nose. It’s evident that this Beaujolais is more of a medium-body wine, a slight contrast to other wines from the region. There are sparse flavors of wood and spice buried under the fruit and I picked up a modest touch of acidity on the back-end. I was delightfully surprised by the dryness on the palate, however the finish was particularly smooth and refreshing while the dryness lingered on the tongue. This subtle complexity was enjoyable as it made me really pay attention to each sip. My assumption that this bottle would be mostly consistent throughout was confirmed after pouring, smelling, and tasting the second glass. Each aroma and flavor experienced on the first glass was still present and I only noticed a very small inclination of additional dryness (again, an attribute I distinctly enjoyed). The overall aroma and flavor characteristics were homogenous throughout each smell and sip. The ’09 Henry Fessy Beaujolais-Villages is a delightful choice for any novice or experienced wine drinker. Fans of both full-bodied and light-bodied wines will most likely find several characteristics they’ll enjoy. The overall consistency of the wine will not present any surprises along the way, but will undoubtedly delight. ♦ When purchasing a $15 Beaujolais-Villages all I’m really hoping for is a light, enjoyable quaffer. This wine, however, delivers a whole lot more than this…An expressive nose of dark cherry, flowers, and spice is particularly enticing. While still being a light red wine, on the palate there is more power and fruit richness than one might expect from a Beaujolais-Villages. There is a nice line of acidity and lovely latent earthiness that emerges as the wine breathes, opens up, and delivers a savoury, sour cherry finish. You can do the whole chilled Beaujolais thing with this wine this summer if you want, but you’ll get more out of it if you let it breathe and warm up a touch. And indeed you could pop it in the cellar for a few years if you wanted to. The florals might be a give away, but I’d hazard a guess that this would often be mistaken for a decent Pinot Noir in a blind line up. A great value wine and the winery’s logo is a bloke with a tash. What more could you want? ♣ Wine Spectator (date unknown), 86 points. 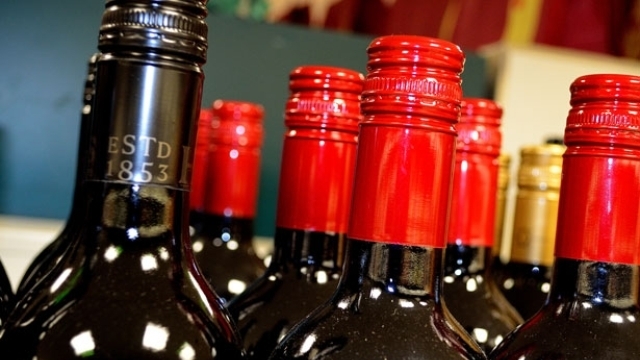 ♦ A tangy red, featuring macerated cherry, plum preserve and hints of spice and smoke. Well-structured and juicy, with lightly chewy tannins and a medium-bodied build. ♦ A series of firm tannins goes with acidity, raspberry fruits and attractive juicy sweetness. A wine for drinking on cold winter evenings. 85 points. ♦ Appearance: Clear, pale purple. Nose: Clean, medium(+) youthful aromas of fresh & candied strawberries and raspberries. Palate: Dry, Medium(-) body, medium tannins, medium(+) acidity with red fruit (mainly raspberry) flavor, medium length. Quality: Good; Drink now, not intended for aging. ♦ 50-year-old vines. Much more red colour [than their plain Beaujolais]. The nose delivered lots of ripe red cherry with floral and spicy notes. The palate was rounded and elegant with nice balance between the rich fruit, acidity and tannins. A real step up in quality – 88/100 points. ♦ A wine deep in color with a fruity and floral bouquet. On tasting, the balance is impressive with a touch of acidity which evens out the roundness and structure of the '09 wines. A Beaujolais Villages with Cru quality thanks to its richness and finesse. ♦ Not as bubble-gummy as some, it's deep ruby,cheerful berry nose. Lovely structured style with good concentration mid-palate. Elegant finish. ♦ 50 year old vines. Deep cherry colour. Spicy red fruit compote nose. The palate was quite acidic and so very fresh and clean and lively with ripe red fruit – raspberry, strawberry, cherry and even some cassis – and some floral notes. Clean raspberry fruit really dominates the supple finish. Lovely, harmonious wine – 89/100 points. ♦ A really ripe wine, rich and with a generous feel to it. The sweet cherry fruit is powered with plum juice, dense tannins and structure. A wine for aging. 91 points. ♣ Jancis Robinson (18 March 2008), 16.5/20. ♣ Wine Spectator (31 December 2012), 90 points. ♦ Rich and smoky, with layers of black cherry puree, grilled plum, gumdrop and black currant. This is well-integrated and fresh, with a hint of coffee liqueur on the finish. ♦ Or head to Beaujolais and the gamay grape. I like Henry Fessy Morgon 2011, which is suitably dry and smooth, with raspberry and cherry fruit flavours and the characteristic Morgon minerality. ♦ A lighter-bodied red wine can be a life-saver where vegetable dishes are concerned. Morgon offers the kind of cherry and plum characters with aromas and flavors that seem to draw strength from Burgundy. Soft and elegant, with some spice, the wine exhibits flavors that do not show excessive reliance on carbonic maceration, nor is the wine filtered. The Gamay variety shows its stuff throughout the wine, which shows a lovely crimson color. Properly corked and stored in the fridge, the wine keeps well over two-three nights, making it a terrific choice for solo sippers. Serve it cool (as with all Beaujolais) around 65F/17F, in medium-sized tulip-shaped glasses. This is a winner. 93 points. ♦ Take everything you ever though about Beaujolais and put it aside. T his Beaujolais Cru is a standout, with structure, fruit, and terroir to burn. $13.99, and a blockbuster for the price. ♦ The first thing you’ll notice about this wine is that it is definitely not light. This has quite a lot of body and it’s packed with flavour. It has loads of red fruit flavours (especially cherry), but also a chalky savoury edge. The wine is incredibly smooth and silky in the mouth, so it’s a great wine to try if you generally find red wines to be too bitter. It’s also worth putting a bottle of this in the fridge 15 minutes before you serve it. At under £10 this wine is a real bargain. If you buy a red wine from Burgundy – which is just up the road – you won’t find anything of comparable quality for close to this price. Buy this now before everyone realises how underpriced Beaujolais wines are! ♦ With its "men with moustaches" image, Fessy might seem a jokey newcomer to the Beaujolais Cru villages. But it has been around a while [since 1888] and makes serious wines, using traditional methods and old vines. This is smooth, silky, but also intensely fruity. Drink with roast poultry or mushroom-based dishes. ♦ 50 year old vines. Bright, purpley grape juice colour. The nose gave flowers, strawberries, cherries and chewy sweets. The palate was fresh and lively at first with bright red fruit and acidity giving way to a slightly bitter mineral note. The texture was soft and supple and juicy. A concentrated wine with a somewhat hard finish – this was the only [Fessy Beaujolais] that seemed as though it might be better in a year, so again living up to its reputation – 89/100 points. ♦ A very structured wine, as befits this normally powerful cru. It is packed with dark tannins and minerality. The wine is angular, and you can taste the granite and schist soil. This edge of austerity is balanced by delicious fruit. 90 points. ♣ Wine Spectator (December 2010), 90 points. ♦ A lovely, dark and smoky red, displaying brambly blackberry, ripe plum and crème de cassis fruit flavors. Lush and velvety, with fine balance and dusty tannins on the dark chocolate–tinged finish. Rated as Outstanding: a wine of superior character and style. 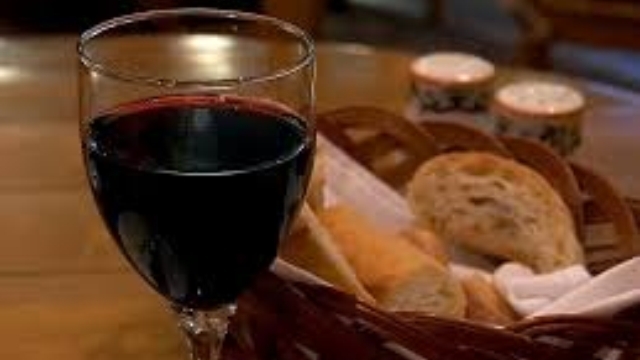 ♦ It had aromas of leafy hedgerow bushes, fingertip-squeezed blackcurrants and warm red berries. Mouthwatering black fruits and gentle spice leave a squeak of acidity as soft tannins ease away to a fruity afterglow. ♦ [T]he Moulin a Vent was the much cheekier affair with livelier brighter expressions of livelier boysenberry jam notes with scents of sage. . . They [this and the Fessy Juliénas] are, in short, my vote for best food wine of 2011 so far. ♦ Moulin a Vent are traditionally the most structured and bold of the Beaujolais. Highly grained tannins with notes of cranberry and just-ripe blackberry. If you think that Beaujolais are easy drinking and vapid, this bottle will change your mind. ♦ The rich, black cherry fruit has a little spice across the top notes. On the palate quite earthy entry to the lively fruit, with the charging acidity and the softest whisper of tannins. ♦ Love these wines. From the 10 possible cru Beaujolais regions Henri Fessy produces some gems. The Moulin a Vent from 09 is a beautiful silken, yet still firmly earthy wine. Gamay stars. This will keep for a while, like three years or so, longer than it will sit around my house. ♦ Serious Beaujolais, made under the names of ten crus, or individual appellations, all located in the northern reaches of the region, is a style of wine very well worth getting to know. You get the characteristic vivacity of fruit, and in the best wines you also get an added gravitas, an intensity of flavour. Hard to describe, easy to enjoy. I have just tasted one such Beaujolais. Henry Fessy Moulin a Vent 2011 . . . is a wine for the memory. Moulin a Vent, so named after a redundant windmill that stands at the centre of the vineyards of the Beaujolais village of Romaneche Thorins, is renowned for making the region's most nuanced wines and this one lives up to it. Although still quite young for drinking now (Moulin a Vent makes the longest-lived wines of all the Beaujolais crus) this is already silky-ripe and deeply plush. If I find a better Beaujolais in 2014 I'll be very pleasantly surprised. ♦ This is a ripe and juicy wine, full of cherry fruit, that also has a sense of structure. It has tannins that promise some aging as well as the natural fruitiness of Beaujolais. Keep this generous wine for at least two years. 90 points. ♣ Wine Spectator (June 2013), 87 points. ♦ Light-bodied, showing a good mesh of ripe black raspberry, pomegranate, stony mineral and ground spice. Fresh finish. ♦ Grade=Outstanding. Small-production, single-vineyard cru Beaujolais, this elegant red is dark and smoky, with rich red berry fruits, light spices and a hint of cinnamon. ♦ Henry Fessy Chateau Labourons Fleurie 2011 . . . is an easy going wine that has decent fruit characters with some elegance and complexity and shows of the youthfulness of the Gamay grape. ♦ This Fleurie, fermented in old vats in the traditional way, has depth and an earthy appeal that balances its fruitiness. The barely perceptible tannins in this mid-weight wine even allow you to chill it slightly for drinking with grilled skirt steak this summer. This is not your father’s Beaujolais. 90 points. ♦ 50 year old vines. The colour was a deep, rich translucent purple. The nose was bursting with soft red fruit with floral notes. The palate was fleshy, juicy and supple with fresh, lively raspberry, cherry and strawberry backed up by nice acidity, light chalky tannins and a little creaminess. A really lovely wine – 91/100 points. ♣ Wine Spectator (February 2011), 90 points. ♦ Attractive boysenberry, black cherry and cassis flavors mix with light licorice and vanilla notes. A tangy minerality drives this light to medium-bodied red and lingers on the herb-tinged finish. ♦ "A lovely, dark and smoky red, displaying brambly blackberry, ripe plum and crème de cassis fruit flavors. Lush and velvety, with fine balance and dusty tannins on the dark chocolate-tinged finish. ♦ A lovely nose of very ripe fresh white peaches and red raspberries that could almost have come from a Riesling rises from the glass of Fessy 2009 Fleurie, which proceeds to invigorate and refresh, with its bright, faintly tart acidity well-woven into the wine’s fruit character rather than detached as was the case with other wines in the new Fessy collection. What’s more, there is no significant bitterness blocking the finish, which is lip-smackingly generous, if not notably complex. Hints of peony perfume and underlying wet stone do, however, add to the interest and allure of a wine I suspect will be best enjoyed over the next 12-18 months. ♦ About thirty years ago reds from the Beaujolais went out of fashion in the English-speaking world, they were dismissed as being too insubstantial, and largely replaced in our favor by full bodied fruit bombs from various parts of the New World. Now some of these are making a comeback. This bottle delivers a nice blend of cherry and plum flavors, without being in the least too thin. ♦ A richly aromatic wine, with swathes of sweet fruit, ripe tannins and a juicy, jammy feel. This is so generous, open, welcoming. There is structure as well, cushioned by the sweet fruits. 92 points. ♦ 50 year old vines. Quite a deep colour with hints of blackberry. The nose was clean and fruity with a little pepper too. The palate was soft and juicy, fresh and clean with some real succulence of fruit and good balance with just a hint of soft tannins. Very attractive and drinkable – 88/100 points. ♣ Wine Advocate (date unknown, 2009 vintage), 87 points. ♣ Wine Spectator (30 November 2010), 90 points. ♦ A lovely Juliénas, with a silky texture displaying ripe, aromatic flavors of griotte and blackberry fruit, and layers of cream, anise, mocha and smoke. There's fine balance to this elegant red, with a lingering, smoke-tinged finish. ♦ Ripe fruit with soft acidity chracterize this wine that has great concentration, jammy flavors, strawberry jelly and a generous plum skin texture. 89 points. ♦ The Julienas was the more serious minded of the two showing characters of black fruit (think plums, blackberry, black cherry), coffee, licorice and cocoa powder. ♦ Concentrated with pure fruit, focus, but still zippy and fresh. White pepper finish. ♦ The aromas in this wine are filled with a juicy core of sweet berry, backed by anise and dark chocolate. This pick is surprisingly big and bold for a beaujolais, but at the same time, it maintains an exceptional balance. Ripe blackberry and raspberry flavors play against tart cherry, while touches of thyme and mineral come through on the finish. ♦ Although there are many schools of thought on the vinification in the Beaujolais, Henry Fessy has remained faithful to the traditional method which favours the balance between the seductive fruit-forwardness and the supple tannins which guarantee good ageing capability. Planted on sedimentary soils with old alluvial deposits, the Juliénas is a well-structured wine, rich in colour and with a good cellaring potential. . . Tasting Notes Revealing pretty strawberry and raspberry notes on the nose, the Julienas 2009 is a very smooth wine with mellow tannins characterised by toasted notes on the finish. ♦ 40 year old vines. Quite a delicate purple colour – not too garish! The nose was soft and grape juice-like. The palate was soft, smooth and intensly fruitywith strawberry, raspberry and cherry characters firmed up by the gentle lace-like tannin structure and acidity balanced by the fruit. Very fresh with lovely balance and a clean finish – 89/100 points. ♦ Other high points [included the] Chateau des Reyssiers, with black cherry flavors infused with hints of violet and lavender. If you think Burgundy is too expensive and you’re tired of overpriced New World reds, pick up a bottle of Cru Beaujolais. It will be a rich and satisfying experience, and you’ll come back for more. ♣ Wine Spectator: 28 February 2013 & 28 February 2011, 88 points. ♣ Wine Advocate (31 August 2010), 87 points. ♦ [A] charming, easy going, light Gamay wine. The robe is light, bright ruby red. Developed aromas of red berries, like red currant and raspberry, with subtle floral perfume constitute the nose. In the palate, the attack is quite juicy and fruity, expanding nicely in a structured, elegant and supple mid-palate. The acidity carries the red fruit flavors with focus toward the lingering, fresh and dry finish. Quite well rounded without excessive tannins, this wine is well made, simple yet refined and charming, somewhat feminine and refreshing with a twist of earthiness. Enjoy it warm temperature with white meat and poultry, or even slightly chilled with fish or cheese. ♦ I’m a big fan of Beaujolais for its fruity, fun style of red wine that lifts my spirits without demanding my attention. Here’s a great “house red” for sipping or dining. ♦ With a deep colour and violet tints, this Régnié has a subtle bouquet of red fruits such as raspberry, strawberry and also jam. Lovely balance between the acidity, body and the tannins which are already mellowed. ♦ The Regnie 2011 reveals delicious aromas of ripe fruits with distinct aromas of cherry. These fruity aromas reappear in the mouth as well as a wonderful balance. ♦ [It] is a bit more delicate and feminine in style [than the Chateau Labourons Fleurie]. Both wines are, in our opinion great wines to pair with the versatility of Chinese cuisine overall and, at this time of the year would be great with the traditional Hong Kong style hot pot. ♦ There can be a bit more [than nouveau] to these food friendly wines though, especially the Beaujolais Cru wines [like this one] that are reflective of their place, produced with finess to display the characteristics of the region and filled with earthiness, spice and often oak mingling with the ripe red berry and blackberry notes in the wine. ♦ Bright red berry aromas of strawberry preserve, some pomegranate and rhubarb, a little bit of mineral and warm, dry earth. A light palate that nonetheless has a surprising backbone of stony tannins, enveloped with enough acidity to really get your gastric juices flowing. ♦ 50 year old vines. The colour was verging on purple-black. The nose was a little dumb, but vaguely mineral – like granite. The palate was quite big and generous with lots of acidic red cherry and rhubarb fruit supported by firm, chalky tannins and a seam of minerality. Very elegant, the most serious yet – 90/100 points. ♦ A wine with considerable structure, balanced by a good dollop of sweet fruits. The wine has weight, a tight final acidity and a finish that hints at some aging potential. 87 points. ♦ Ignore the ludicrous hype that is Beaujolais Nouveau Day this month and instead stock up on this generously discounted example of the best the area can offer. A world away from frothy Ribena-style Nouveau, this is medium- to full-bodied, mellow and slightly spicy, yet full of the characteristic vibrancy of the Gamay grape. Good with grilled meats and hard cheeses. ♦ WOW. This wine is proof that a pedigree sometimes does mean quality. . My first reaction was "mmmm juicy!" A fresh wine (hmm for an `07 - now that is something [in 2011]) with straightforward juiciness, cherry/raspberry and a finish that is more of a statement; after you have had a sip, you just move your tongue around a bit and you can taste the tannins. They don't overwhelm - the wine was well on its way to my bloodstream before I even thought about tannins. There is no doubt that they are there, which is a simple reminder to my brain that another sip would be welcome. ♦ This week’s stand out wine is the delightful Henry Fessy Brouilly 2011 however. Bright, fresh and showing forward fruit flavours of raspberry, red cherry and strawberries, it is lightly spicy and floral with smooth tannins. ♦ Henry Fessy Brouilly 2011 . is my favourite Beaujolais of the moment. Brouilly is the most southerly of all the Crus, and makes suitably sunny, ripe and intense wines, among which Fessy's stands out magnificently. ♦ A fine example from the largest of the beaujolais crus, tasting of fresh redcurrants and wild strawberries. Ripe by beaujolais standards, it is still light enough. ♦ Blueberry and blackberry skin. Medium to full body with lovely texture and a fruity, bright finish. Love how the wine changes with air going firm and lightly earthy. 91 points. It's not wildly higher-rated than the bottlings listed above, but it isn't wildly expensive, either, so call it a small splurge: Louis Jadot Chateau des Jacques Moulin-a-Vent Clos du Grand Carquelin.